There are two ways of running: from within or from without. Both are equally valid. They're like different ways of seeing the world, though it is not possible to hold both at the same time. The second is probably faster. London could almost become a habit or a tradition. Elias and I took the train down to Lewisham on Saturday afternoon, stopped to meet my friend (marathoner and French book historian) Sophia for a smoothie on the way, met with Nicky, and landed at Ned and Kath's. John and Jane were there, plus Sean and Meike with Janni. And they were all drinking. It could almost have been a re-run of last year. John Crannage, of Heroes of Switzerland fame (you can see them live, or at least hear them, gazing at their shoes here, or, better, here, where you can also buy the CD) was there too. He's a minor character in this blog, here and here, for instance. Except that this year Ned and Kath had moved to a house a few doors down from John and Jane. And Sean, of course, was injured. So the teetotallers were in the tortured minority of two: me and John C. John and I sat quietly through a riot of 80s pop and light rock (someone had left Sean with the stereo controls) and harboured our thoughts. As the hour draws near you begin to feel insulated from things. Not tense, but peaceful, an air-eater. Surrounded by sirens and lotus-eaters. What did we eat? Pasta of course, spaghetti bolognese. And apricot crumble and chocolate brownies. And when we were full we knew we'd had enough, and we just wanted to retire to bed, and plant our feet up on cushions and dream of lines. Nicky and I slept upstairs in John and Jane's studio attic, a brackish night. Sleep was interrupted in the way it always is on pre-marathon nights. Elias curled up in a sleeping bag in a day bed, and the house was as quiet as a church mouse. Because the riot was still going on three doors up the road, where John C was being kept awake by drinking and singing along with Abba and so on. Dawn came with a flush of light through the curtains, and I saw the future. The weather forecasts had varied between heavy showers and light showers (I'd been watching them nervously all week). But instead what I saw and felt was April sun, tenuous at first, but then fat and full. It was going to be warm. Pulses would be raised. The water tables would be crowded. The spillage would evaporate from the tarmac. The crowds would be full-throated and happy. The runners would expire and slow. I put on my vest - I had pinned on the number last thing the night before - and leggings. Five years ago, when I took up running, I had to wear really baggy shorts because I was faintly embarrassed both about the running and about showing my legs. These days I wear lycra compression tights. Elias thinks it's embarrassing; Nicky rather likes it. If I were to stop and think about it I'd probably stop: 42-year old English professors should never, never wear lycra. In fact after writing this I may well stop. They feel great. But they are rather revealing (and I've never seen the back). I picked up a text from John C, telling me that up the road the porridge was ready. Outside the air was still crisp, but you knew it was going to turn. A room full of hangovers and a bowl of porridge. You drink water hard, and then stop. Endless ribbing (a bit premature for pinning your number, don't you think? What shoes are you wearing? You're not really going to carry the gels, are you? Have some of this, you'll be grateful at the 20-mile mark). Your muscles heavy with glycogen, your stomach hot with carbs. The green stripe says it all. It means I'm at the new 'Fast Good for Age' start, which is at the front of the red, mass start. The old 'Good for Age' start was at the very small green start, but it was positioned behind the celebrities, which meant you had to shove your way past the good, the bad and the ugly before you got an open road (at which point you joined the runners from the blue start, causing more mayhem). The Fast start has a lovely small pen, and you can show up late and still be near the front. So even though 31591 has no music, that green diagonal does. Then we all congregate and walk to blackheath, a twenty minute walk full of emotions that you can't distinguish well enough to name. Blackheath is lovely at this hour. The blimps indicating the three starts float high. The grass is bright. All smells of spring. We say goodbye to the gang. I exchange expressions of support with John C, as he heads off to the red mass start (unfortunate: hence, perhaps, the face), find my pen, and join the toilet queue. I speak to the two guys in front of me. That's one of the great things about races: social boundaries break down, and you can speak to strangers knowing they'll share something. I speak to Giulio (Boundary Run and Milan), Alessandro, Simon, and Fergie, all at the Fast start. Fergie and I are looking at about the same time: we've been training together, including a very fast long run, and some Yasso 800s with Simon too). Even the Fast start has its share of fancy dress. There's a smurf. And a Lara Croft: I wished I'd had a camera for her. The really odd thing about the fast start, however - it's definitely noticeable - is that most of the men have shaved heads or crew cuts. My curls are out of place. I begin to worry that either a) they slow you down, or b) no one will think you can run. 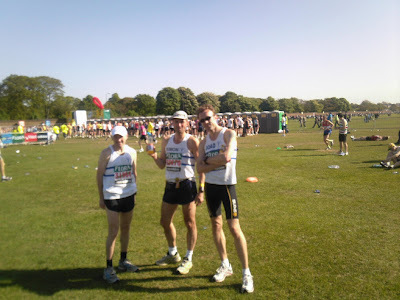 But it's too late to dwell on that, because the next thing I know is that it's 9:40 and everyone is already at the start line, forcing me, Simon and Fergie to line up at the back. Not everyone in front looks very Fast. Perhaps they'll consider a 'Fast (really)' start next year. And it begins. I watch the clock at the start gantry. Seconds tick by as we nudge forward. It's a full 45 seconds before I cross the start line (last time I did New York, I think it was a mere 20 seconds, and I was at the mass start - now why is that?). And there are 20,000 people behind me. It doesn't bear thinking about. So we run. Fergie's sometimes in front, sometimes behind, Simon usually just behind. I can't see Giulio. I can see lots of other people getting in my path though: it's the way with London. You just have to be patient, and not waste energy getting irritated. It's been worse. I realise with some regret at the first mile marker that I seem to have run it in 6:15, which is disappointingly fast. I've forgotten that universal lesson, which I have dispensed to others on countless occasions: don't start out too fast. And we run. And it grows warm. And I grow hot. I take on board lots of fluids, but I can feel that this is far too much effort. The heart diverts blood to the skin to cool down, and this can accelerate your heart rate by 10 beats per minute. You begin to feel that after a while. There are no clouds, just a hot, cerulean canopy, cruelly smiling on us. At 10 miles I know I'm cooked. I'm too hot. There's this irritating bloke called Simon (not my Simon, whom I've lost track of) behind me. The crowd keen on cheering out his name. He's obviously some minor celebrity. At one point I look at him. He's in his twenties. I don't recognise him. Which confirms that he must be a minor celebrity. Probably presents a TV programme, or was once in a TV programme. Recycles other people's ideas about fashion or house decoration. Probably works about two hours a day, and gets to run as often as he wants, which explains how some minor celebrity can keep up with me. Worse, John has drifted off ahead of me. I lost that psychological contact at some point, then I lost sight of him. I'm running at about 4:11 a kilometre, not the 4:06 for which I was hoping. My left ankle is going to carry me - I can tell that much - but it is sore and stiff. I'm developing a blister on my right heel. I'm cooked. London looks nice in the sun, however. It's a nice day for watching. The clouds drift in for about a minute, a temporary cooling period, but they soon evaporate. It's quite glorious really. Tower Bridge is magnificent. For a wonderful moment I'm on my own: there are no runners in the ten metres in front or behind me. I've never seen that at London before. I'm slowing, though I keep passing people. London marathoners must all run huge positive splits (where the second half of the race is slower than the first). Every mile I pass dozens. Unfortunately at about 14 miles I hear people shouting encouragement to Father Christmas. And then it happens. A man in a fancy dress costume passes me. A shaven-head Santa. It is about the half-way point that I realise that I'm not getting a new Personal Best today. The halfway point passes at 1:27:58. A good time is going to take a big negative split, and I can feel that I don't have it in me. I calculate the numbers a million ways (I'm a maths wiz normally, but it's the first thing that goes when my pulse tops 100) and I can see that it won't happen. So I do the only sensible thing. I relax a little. I accept that I'm not going to break 2:54:36, not today, and so I resolve to take things a bit easier and enjoy myself. So I run from within. It's a funny thing. When you race, and when you train hard, it's often about beating other people. Times are things too abstract to focus on, so, although you may be aiming for a time, you use other runners as markers for that time. You'll say: in order to run under X, I will pass him ... then her ... then him. Your body may be very good at feeling and sticking to a certain speed, but external markers of time help you focus. When training at the track you learn to hang on to the runner that's faster than you; perhaps you try to pass him on the final repetition. Sometimes, however, you run within yourself. People say that to me often: 'you look like you're running within yourself'. It usually means that I'm comfortable and am not trying hard enough, when I shoul dperhaps be in the red zone. But there's another, underappreciated aspect to this. When you run within yourself you are powered by the positive feelings of pleasure, and sometimes those numb pain and push you along anyway. 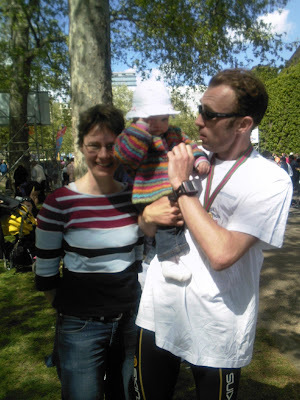 Once, in a particularly disastrous period of my life, I ran the Milan marathon a mere six weeks after the Berlin marathon, and deliberately took it easy, running only for the pleasure and not caring about time. Somehow I ran 2:55:58. Whatever pushed me along at that pace came entirely from within. Unfortunately the outcome would be very different today, but I nonetheless carried with me that ease of movement and lightness of spirit, which made the race a more pleasurable thing. They say that you have five or six good marathons in you, when everything comes together and you run well. I've had New York, and Berlin. This wasn't one of those occasions. I was doing fine, but the chemistry of age-defying brilliance wasn't there. Perhaps it will come another day. With my foot off the accelerator, but knowing that I would probably come in under three hours, I ran on, and looked around, feeling like a child smelling new things and seeing the light of day. I pass dozens of people, some now walking, some stretching muscles against barriers. There are so many faces. Everyone is alive and living, so many centres of consciousness. Imagine you could hear their thoughts, pitched at this intensity. I imagine that every single one has as many things going through his or her head as I do every second, I imagine the countless moments of consciousness of 40,000+ runners as they run 26.2 miles, and I imagine I can hear them all, like one of the angels in Wings of Desire. It would be heartbreaking - and deafening. I have to stop imagining that. I have little positive to say about miles 17 through 22. They're mostly very dull and ugly. But once you're at 22 miles you feel closer to the Thames, and you know that you are free to do what you want because you will probably finish. Simon was history. The crowds were vocal, calling out names as if they cared. Children proffered Jelly Babies through the railings. I dumped bottle after bottle of water over my head. The wild darkness I had looked for does not come. These miles go by all too quickly. I'm running at - as I discover later - three hour pace, and all feels fine. There is the usual horrible moment when I feel a rippling in my calves (this time it's both), as if cramp is beginnning to set in. But I just alter my form slightly, by speeding up, and it goes away. I count down the miles: 22, 23, 24. I like running by a river in the sun - not racing, running - it's my fourth favourite pastime. I pass Parliament, and hear the voices chanting in favour of Tamil separation within Sri Lanka. Someone there is dying. We run on, through the crowds, now really deafening (and, I have to say, in a mushy kind of way, it really is heartening to hear people calling support as if it matters, as if they know how it feels). I know that this stretch has more turns than appears possible when you look at the map, but this year it doesn't matter. I'm running within myself, and I'm doing fine. And then for a moment, with about a kilometer to go, I think I see Fergie. I look harder. I realise I must be hallucinating in the heat. I run on. And then, I see him for certain. He's under the '600m to go' sign. And I think: 'I'll have him'. Now Fergie is fast. He doesn't have a job and gets to train a lot. And he has a shaved head. And I know for sure that he's faster than me, because I've been training with him (read 'behind him') this season. Except on some sessions I can tear in front of him on the final repetition (of 6 or 10). So the prospect of catching him when he's 100m or 150m ahead of me and we have 600m to go is simply not realistic. But, discounting this, in that magical zone you only inhabit when you're in a big marathon on a sunny day and you feel good, I start running outside of myself. And sure enough, with 100m to go, or less, and with the finish line in plain sight, I fly past Fergie. The heart is a strange place. When it sees a finish line it can do untold things. It knows more than it lets on. This is one of the reasons why runners are runners, I think, though they can't explain it. Sometimes it lets you do things that are born in chaos. I fly to the finish line. Only as I am two or three metres short do I feel a sharp knock on my right arm, and know that Fergie is there. I am sandwiched between him and another runner on my left. I think he passes me. I don't know. Perhaps we cross the line together. Not that it matters: for some unaccountable reason I've stopped competing at that point. Fergie and I head off through the maelstrom of the finish area, collect medals and goodies (valedictory medals and T-Shirts for Flora, which is withdrawing is sponsorship of the marathon) and part ways. 'Honourable draw' he says in his gruff way. He looks a bit tired. Now, there's a great paragraph on the last minute instructions for the London Marathon that says that 'runners numbers are assigned randomly to avoid congestion at the baggage lorries'. Because you wouldn't want to do what they do in Milan -- assign numbers according to predicted speed, and then put numbers 1-500 on one lorry, 501-1000 on the next, and so on, so runners all congregate around the same lorry at the same time. London has sensibly avoided this idiocy. Except with the Fast Good For Age. We're essentially all the runners who come in between 2:45-3:15, and we all have to claim our baggage from the same lorry. But it's not so bad, and it's not long before I meet Sean and Nicky, and have my photo taken with Meike and Janni. Sean's glum because he didn't run, and I don't blame him. Meike exclaims: how can you look so normal after doing that? But the good feelings always overcome any pain, and you soon get your breath back. And what, I ask myself, have I learned? I suppose I now know, without any doubt, what it takes to run this game. Nicky and I head off to the pub, just off Trafalgar Square, where my club, Cambridge and Coleridge, is meeting. But they're not there yet So we sit at a window seat, with the sun warming our backs, and drink a glass of red wine. My recovery drink after a week on the wagon. 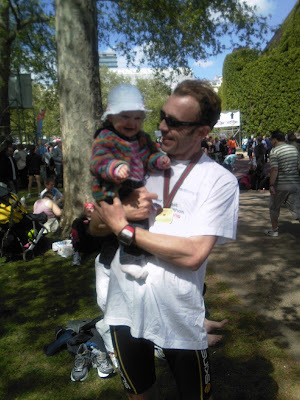 And then we travel back to Lewisham, through other runners, limping, smiling and not, meet up with Elias (who's not feeling well: back to parenthood, and the rest of the week begins), and catch up on the news of the other runners. Chanti (Ian Chant) has done well. John Crannage has made a big leap to 3:03 from 3:11, though those in the know thinks he may have more in him. and so on (more below). Simon doesn't show up in the results, and so I worry about him. When I hear of people who've run good times I think - and I wouldn't say this in public - why didn't I try harder? But the feeling is a good one. And after a while we beat our ways back to the fens, and back to more measured, more accountable life. And besides, after all the noise and doubt, I'm running Edinburgh in five weeks, so I always have another chance to run outside. I may receive some more photographs shortly, so I'll add them in as they arrive. so impressed by your achievement: well done you. What's next, eh? Marche des sables? That's an ugly face I'm pulling there! Thanks for the number scrunching tip, I didn't flap at all. Good luck at Edinburgh.